*Price above based on 1-year term before application of coupon code/introductory discount. While you may pay less for the first year of hosting, unless otherwise indicated, the pricing displayed on this page is the 1-year term renewal rate. Star ratings based on a 0.5 minimum to 5 star maximum scale. **While Aplus.net is not currently rated by the BBB, their parent company, Deluxe Corporation, is currently rated A+. Aplus.net provides tools designed to allow small businesses to manage their online presence. These include domain registration, e-mail services, marketing tools, do-it-yourself website builders, we-build-it-for-you services, and three shared web hosting plans. Priced $7.99 per month for a 1-year term, the cheapest plan includes 24×7 phone/chat/e-mail support and a 30 day money-back guarantee. However, the plan’s scalability and advanced options are somewhat limited. While our reliability testing did produce a perfect 100% uptime rating, server speeds were amongst the slowest recorded to date. On balance Aplus.net has earned 3.5 stars and is NOT RECOMMENDED. Aplus.net is a subsidiary of Deluxe, the best known check manufacturer in the world. Designed to provide easy-to-use tools that allow small business to manage their online presence, Aplus.net offers a number of website hosting services that include complete design, development, and management; do-it-yourself website building tools; as well as shared hosting services. Aplus.net offers three shared web hosting plans — Basic, Business, and Professional. All provide a choice of monthly or annual billing cycles. Pricing ranges from $7.99 to $23.99 for monthly billing, and $9.99 to $29.99 per month for annual billing. All shared plans renew at the initial rate. Priced at $7.99 per month, Basic Web Hosting is the cheapest plan. Highlights include a free domain name (first year only, renews at $12.99 per year), 100GB of disk space, 500GB of transfer (bandwidth), the ability to host 2 websites, 5 e-mail accounts, 2GB of e-mail storage, auto-responders, unlimited FTP accounts, unlimited subdomains, 25 MySQL databases, EasySiteWizardPro, a 1-page mobile site, custom error pages, a site search engine, domain forwarding, analytics, as well as a proprietary control panel (see screenshot below right) and applications installer. The Basic plan also provides a limited number of applications: WordPress, Coppermine Photo Gallery, Image Manipulator, Customer Survey, HTML Editor, Joomla, Online Forms, PDF2Web, Photo Album, phpBB, Site Search, and Site Stress Test. Screenshot of Aplus.net Hosting Control Panel. Not quite as easy to use as cPanel, we found it to be a workable substitute. Click to enlarge. The Basic plan supports the following programming languages and advanced features: ADO.net, Ajax, ASP/ASP.net, C/C++, CGI Scripting, Cron Support, GD Library, IIS ASP Components, ImageMagick, IonCube Loader Support, Own CGI Bin, Perl, PHP 4/5, Private Database Folder, Python, Ruby, Server Side Includes (SSI), XML Parser, Zend Optimizer Support, and Tomcat JSP/Java Servlets. Priced at $15.99 per month, Business Web Hosting is the next cheapest plan. It includes all of the Basic plan features while substituting 300GB of disk space, 3000GB of transfer, the ability to host up to 20 websites, 250 e-mail accounts, 5GB of e-mail storage, and 50 MySQL databases. The plan adds 1 MS SQL database (150MB), $50.00 in Facebook ad credits, MS Frontpage Manager, and Mobile Express DIY. Priced at $23.99 per month, Professional Web Hosting is the most advanced and costly shared plan. It includes all of the Business plan features while substituting unlimited disk space, unlimited transfer, the ability to host up to 100 websites, 500 e-mail accounts, 100 MySQL databases, and 2 MS SQL databases (200MB). The plan adds an SSL Certificate, EasyStoreMaker Pro, osCommerce, and the Pinnacle Shopping Cart. The plan does not include Mobile Express DIY. Additional-cost options for all three Aplus.net shared web hosting plans include: email marketing, fax-to-email, Domain Guard, Domain Monitor, Domain Privacy, OneList, Ebiz Card, InForm, call tracking, Mobile Express DIFM, Mobile Advanced DIY, WEB Chat, and advanced analytics. All Aplus.net shared plans are backed by 24×7 phone/chat/e-mail support, and a 30-day money-back guarantee. Click the ‘Pricing and Features’ tab above for the feature comparison table. As is our practice, we selected the lowest-cost shared plan — Basic Web Hosting — for purposes of testing and review. Starting at main navigation menu on the Aplus.net homepage we selected ‘Website Hosting Packages’ and clicked ‘Hosting Products’ from the dropdown menu. Beneath ‘Basic Web Hosting’ in the ‘Plans & Pricing’ section, we clicked the orange ‘Add to Cart’ button. The first step of the checkout process — ‘Look for a New Domain Name, or Use One You Already Own’ — requires a selection from three options: ‘Register a New Name For Free,’ ‘Use My Current Name,’ or ‘I don’t need a domain right now, thanks.’ As we would be using a domain name we already own we chose the second option and clicked the orange ‘Search’ button. 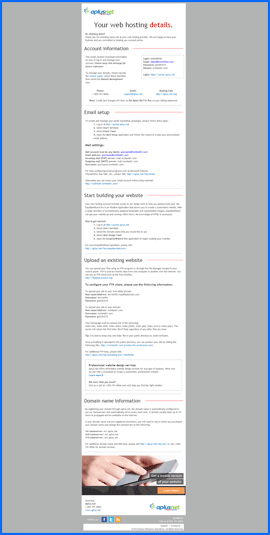 Screenshot of Aplus.net “Welcome” e-mail. It includes all of the information required to set up your website quickly. Click to enlarge. The second step asked us to select from three options: ‘Would like to register a new domain,’ ‘Transfer the registration of an unlocked domain to Aplus,’ or ‘Host an Existing Domain.’ While it seemed odd to ask us to enter the domain name again, we selected the third option by entering our domain in the form field and clicking the gray ‘Search’ button. The third step — Domain Extras — provided the option to add Domain Guard and/or Domain Monitor to our order at an annual cost of $4.95 each. We left the two options unchecked and clicked the orange ‘Continue to Checkout’ button. The fourth step — Create Account — required us to enter our name, e-mail address, and a password. We completed the form fields and clicked the orange ‘Save and Continue to Check Out’ button. The fifth step — Billing — required us to enter our payment method and billing information. It provided a choice of three payment options: Visa MasterCard, or American Express. We used a Visa card, entered the required information and clicked the orange ‘Save and Continue to Check Out’ button. The sixth step — Order Review — allowed us to review our order details and select a billing cycle. The options include of 1 Year at $95.88 per year ($7.99 per month) or 1 month at $9.99 per month. As we only required the account for purposes of testing and review, we selected the monthly payment option and clicked the orange ‘Place your order’ button. Only seconds after submitting our order, we received our e-mail receipt. Just over an hour later, we received the “Welcome to Aplus.net Hosting” e-mail. See screenshot above right. We are pleased to report that the e-mail provided all of the information required to set up our test site quickly. This included the control panel login, support contact information, e-mail settings, instructions on accessing EasySiteWizard Pro, FTP access details, and nameservers information. Aplus.net Uptime Test Results Chart. Click to enlarge. Next, we updated the nameservers at our domain registrar. Once the domain name had propagated, we used the FTP access instructions to upload our 1-page test site. 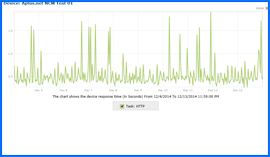 We then set up Dotcom Monitor page-load speed and uptime testing, and waited for the test results to accumulate. 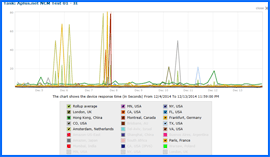 Aplus.net testing began on 12/4/14 and concluded on 12/13/14. Our test site was checked for page load speed and uptime every 15 minutes from 13 worldwide locations. In all, testing consisted of nearly 2000 individual server checks. We are pleased to report that Dotcom Monitor testing resulted in a perfect 100% reliability score. See uptime test results chart above right. Aplus.net Speed Test Results Chart. Click to enlarge. Although reliable, our Basic Web Hosting shared plan recorded a very slow, 10-day average speed of 2.2407 seconds to load our simple, one-page test site from 13 locations worldwide, and 1.4208 seconds from 7 U.S. locations. This was in some part due to the fact that a total of seven TCP 10054 (an existing connection was forcibly closed by the remote host) errors were recorded on 12/7/14. The affected test locations were Montreal, Florida, Frankfurt, California, and Amsterdam. Speed testing concluded on 12/13/14 at 23:59 without additional incident, but the damage had been done. See screenshot above right for test locations and results chart. While they proved to be both reputable and reliable, Aplus.net recorded some of the slowest page-load speeds recorded to date. Aplus.net earned 3.5 stars and is not presently recommended by NCM Online. Cheap website hosting company price comparisons based on 1-year term list price before coupon/promo codes or limited time/introductory offer discounts. These are the renewal rates for the second year of hosting. To ensure that you receive the most affordable Aplus.net pricing possible, please see Summary above for coupon code and/or current discounts before making any purchases. 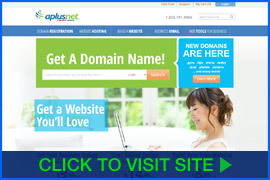 Aplus.net is an online company that specializes in website hosting and domain acquisition. Aplus.net strives to be the consumer’s one stop shop for all informational technology needs. Aplus.net offers a plethora of services related to the web hosting and domain name industry. Begun in 1992 as Abacus America, Aplus.net launched its operations in the time period before “the Internet” was even a household name. By 1995, the upstart company was expanding to the web. By 1998, Aplus.net was selling web domain hosting services. Since then, Aplus.net has added peripheral online services and applications such as EasySiteWizardPro and the Social Page Creator. Aplus.net offers as an incentive a free starter website along with access to their user friendly control panel. At Aplus.net, security of clientele is given utmost importance, with free domain locking service (to prevent the unauthorized transfer of your domain). Full domain management and administration is available to clients, to include the management of registrant and administration details, billing, and technical contact information for the client’s domain. Simple renewals may also be effected through this feature. Aplus.net designs websites for business and personal usage as well. It advertises over 5000 professionally designed templates from which clients can choose. They boast the broadest selection and most cost-effective delivery of services and websites of any domain hosting provider going. Their website claims that aplus.net strives to provide the most comprehensive and cost effective products and services to clients who wish to run a smaller scale online concern within a broader scope. They seek to provide dependable and versatile one stop shopping for a business’ online marketing and their goal is the elimination of clients’ needing to deal with multiple vendors and service providers, as per their website aplus.net. Aplus.net offers a money back guarantee if their domain server and hosting platforms fall below a performance rate of 99.99%. Having hosting platforms in several countries throughout the world, Aplus.net is positioned to offer premium, secure domain hosting services at competitive cost. Their employment of top of the line equipment and multiple storage sub systems lend to their reliability and security. Their basic network is comprised of the latest application technology developed and furnished by Cisco, itself a leader in modem and network security applications. Moreover, Aplus.net is a Microsoft Gold Certified Partner. This means that aplus.net is extensively knowledgeable of Microsoft platforms and systems, and utilize this expertise in bringing their services to the small business owner. Aplus.net has extensive expertise in helping small and medium businesses achieve greater results and draws from its history of helping clients achieve their own entrepreneurial goals. This company also provides ancillary services such as fax to email services, logo design for your website, email marketing (a burgeoning sub-specialty within the domain hosting industry) and the provision of SSL certificates for a client’s financial and informational transactions. Aplus.net offers round the clock support. This video tutorial demonstrates the installation of WordPress on an Aplus.net shared hosting account using their proprietary control panel and applications installer.